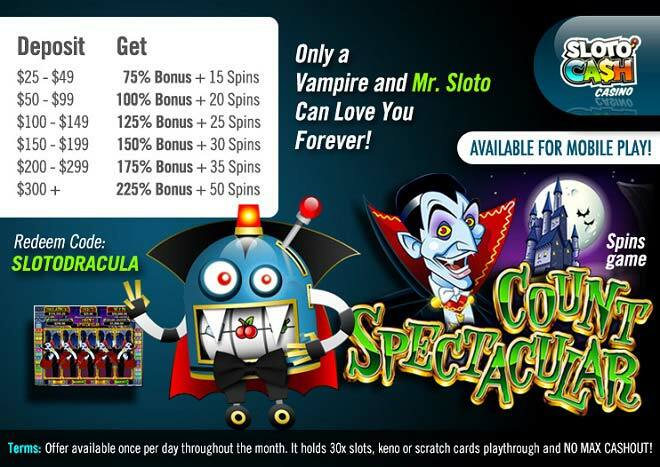 Play 225% Bonus + 50 Free Spins With Mr. Sloto Dracula! This October embrace the myth of our own Count Spectacular trekking through the Transylvania inspired reels as he joins Mr. Sloto in the quest of giving you up to 225% Bonus + 50 Free Spins! Land two Count Spectacular symbols on the first and fifth reels at the same time, and you’ll trigger the spooky bonus round where you can either choose 4 free re-spins, or 12 games with a 3x bonus multiplier! Mr. Sloto knows how to pick his friends – and Count Spectacular will be a really good one to you this October as soon as you deposit a minimum of $25 and play from your desktop or mobile device!